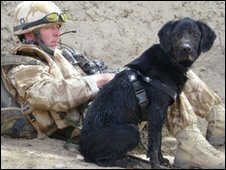 A search dog that sniffed out bombs in Afghanistan is to be honoured with the animal version of the Victoria Cross. Princess Alexandra will award black Labrador Treo the Dickin Medal at the Imperial War Museum in London. The now retired dog, from 104 Military Working Dog Support Unit, North Luffenham barracks in Rutland, twice found hidden bombs in Helmand province. Treo will be the 63rd animal to receive the medal created by veterinary charity the PDSA to honour gallantry in war. The eight-year-old dog will be joined by his handler, Sgt Dave Heyhoe, at the ceremony on 24 February. The pair have worked together for five years and Treo has now become a family pet. PDSA director general Jan McLoughlin said: "We look forward to honouring Treo with the PDSA Dickin Medal. "The medal is recognised throughout the world as the animals' Victoria Cross and is the highest award any animal can receive for bravery in the line of duty. Treo is, without doubt, a worthy recipient." A total of 26 other dogs, 32 World War Two messenger pigeons, three horses and one cat have won the award, introduced by PDSA founder Maria Dickin in 1943.